Question: During the convention, we made efforts to be born, but how can we synchronize them with the labor pains that come from Above? Answer: That is why we are given exercises from Above: There is a time of descent, and a time of ascent; there are times when we get together and when we study. And the most important states are those when we unite with each other: during the lessons, other joint activities, and at the conventions. Now, we add our efforts to the natural labor pains in order to accelerate this process. And in fact, our actions today speed up our birth both quantitatively and qualitatively. As a result, we begin to understand and better feel where in fact the most crucial point is, where we need to press, what a newborn will be according to our expectations. A newborn is our next degree, like children going after their parents, that is, our next state. We pass all these states due to the concentration of our efforts, in addition to what is given to us from above. We do not feel in our work what belongs to the preparation from the Creator’s side and what He does. We apply pressure, trying to annul oneself before everyone else in order to create one heart, one desire, and trying not to interfere. But everything else is done by the Creator. He awakens desires in us and we act, but it is not added to our own account. Only our effort that we apply in order to annul ourselves, our self-sacrifice, is counted. Such actions are given to us with great difficulty and for a few moments. But nothing more is required; we can acccumulate these moments and very quickly reach the force of bestowal, and feel this force clothed in us. This is called the revelation of the Creator to the created being. Question: When we try to hold on to the thought about what’s important, we are distracted again and again by other matters. How frequently should these entrances and exits change? Answer: Once one of Rabbi Zusha’s students told him that he had experienced several ascents and descents that morning; in reply, Rabbi Zusha said that he had experienced close to 400 ascents and descents in a few minutes time. Apparently it is impossible to measure this variable, since on the whole spirituality is above the range of the frequency of the entrances and exits, of the ascents and descents, in an infinite frequency. There are also higher frequencies in our world, for example, in computers, radios, laser technology, etc. Spirituality is much higher than that. So when does a person connect to the infinite frequency? When he begins to perceive the ascents and descents as one whole. In that case they become a kind of “even voltage”: There are no “peaks” and no “holes,” everything is incorporated in a common direction. Only in our world, the plus is associated with the positive direction, and the minus with the negative one. According to such an approach even the plus doesn’t lead to anything good. But when I perceive such darkness as light, the descent as an ascent, when I realize that everything comes from one source and only in order to lead us forward, then I am equally happy about the ascents and the descents. I am even happier about the descents since by them I see that I am advancing. An ascent can stem from different reasons, like for example from the bribery of my ego. A descent, however, will surely be beneficial since Pharaoh is bringing me closer to the Creator. I should immediately rejoice when the descent comes although there are moments of the hardening of the heart and confusion that I cannot even tell apart. But the moment I notice that I am detached, disconnected, from spirituality, the moment I realize that I have been “thrown away” for perhaps a quarter of an hour already, half a minute, or even a second, I am happy. After all, I have recognized the problem. It was created from Above, but I have reached its essence and I am glad about that since I am sure that I have acquired a new depth and that I “sanctify” it now. Question: During the Arava convention our group received a huge new level. Now we have to cling to it and keep it, and this requires repulsions. But on the other hand, according to the example that Baal HaSulam brings, in order to jump on the table you need to jump above it. So what is the next point “above the table” that we should focus our efforts on? Answer: This week everyone will go home and we will return to our daily routine. For me, personally, the daily routine is the main thing; the conventions are a result of that routine. Day after day, we will work on ourselves increasingly more strongly, opening what we attained now and getting ready for the new revelation. This is all our work. The convention itself is not work. We made such great preparations and so we succeeded. Part of that success was the women’s convention. In addition to that, collecting money for our new home and uniting around this problem created a surprisingly powerful force. Of course, we mustn’t forget the congresses in Kharkov and Novosibirsk. Eventually we see that we have matured. The world is advancing faster downhill while we are rising accordingly. Here we have to keep clear frameworks: attend the daily lessons, read my blog selectively, participate in the workshops, and disseminate. The main thing is self-examination and self-report: a person must constantly check oneself and one’s connection with the group. In this context, during the lessons and the workshops, we are expecting new states and increasingly deeper issues. Today during the lesson and the workshop we will already continue what we have started during the Arava convention. In this type of work, we fill the vessel drop by drop, until we “leap” to the next level, and thus over and over again. Don’t neglect these daily additions that are accumulating “penny by penny.” There is no other way. By that we discover many vessels, desires, internally. Even if it seems that nothing happens, the outcome of these efforts will, in fact, be discovered later on. It is the same with a child who has to go through different states in the human environment. If he doesn’t have such an environment during the first years of his life, then nothing will help afterward: No matter how much you invest in him, he will never be a human being. The different examples of Mowgli–children prove that. How could that be? The thing is that he did not develop his desires in time. We are also dealing with things that are essential on the current level of our development, and so we have to dedicate the time to study and to internal changes by trying to value every moment in this work. The desire of Malchut of Ein Sof (Infinity) is initially divided into five parts because that’s the way it was created, from the root phase was born phase one, then the second, third, and fourth. Phase four, in turn, is also divided into parts. This phase is already the desire of the created being that feels that he exists and that he is standing before someone whom he wants or doesn’t want to resemble, to receive or not to receive from. These five phases already exist within the desire itself. Before phase four there were all the attributes, the phases of the Direct Light, and in phase four, it is already a desire. When this desire corrects itself after the shattering, it also has to go through five phases of correction. It is impossible to correct something half way or one fourth of the way; it has to be a whole level each time. Like in physics, there is no material that is smaller than a quantum, a photon, a fundamental particle. We measure the quantity of matter and energy according to these elementary particles; it is a manifestation of desire. Therefore, our prayer must be a whole prayer: not that we should be helped with a half, a quarter, or even 99% of a prayer. Only when it is finally stabilized is here the leap to the next level, to the next attribute, to a value, to a new quality, that did not exist before. This means that a totally new attribute appears 100% in comparison to what existed in 99.99%. This is the difference between incremental, discrete advancement and integral advancement in a circle. In that case, all the attributes connect and become a whole attribute. Therefore, it is called a whole desire. It is whole not because it has just grown to 100%, but because of its quality. It becomes round, completely permeated with that attribute, and otherwise it cannot be perceived by the mind or the heart. This desire of 100% cannot enter something that is foreign because it is so round and perfect that it is absolute wholeness. Until we reach such a whole desire, we will not be able to understand this and will not receive this spiritual revelation. Even later, on all the other levels, we encounter the same law. “There is no small amount in spirituality”; rather, there must be a whole desire. But if a person sees that he hasn’t attained a whole desire yet, he must pray and when his prayer, the deficiency and the demand to attain a whole desire is finally clarified, he will receive a whole desire from Above and in it the revelation of the Creator. Question: What is spiritual despair? Answer: Spirituality is bestowal. There is no such attribute in our world. My job is to locate it from the opposite state. This means, to understand how far I am from that attribute and at the same time to feel how much I need it. If I attain such an understanding, then a strong desire to penetrate this attribute will be stabilized in me, and this desire will turn into my prayer, my request, my demand. If I really want to attain spirituality, a force comes from Above and reveals this attribute inside me. Then I begin to feel the other part of reality that was concealed from me until now and is now being revealed. Now we are living in only one attribute, receiving, and because of this our lives are so miserable and short, made only of losses that don’t lead to anything good. But when I enter the attribute of bestowal, by annulling myself and overcoming the psychological barrier, ready to give up everything, I move to the other side of this inner psychological barrier (Machsom), and enter the spiritual space that is total bestowal. It is like a person who stops breathing, and after actually having done that, he feels that he can live without air. Then a new space is revealed to him, a new world. It is just an example, since it cannot be conveyed more accurately, as there is no similar attribute in our world. We feel despair since there is no way I can attain this attribute by myself. Through the group and the study, I finally come to the decision that I cannot do that, but I have no choice, I must have it. Then I receive this opportunity. “A Department of Defense report notes the military must recruit about 15 percent of youth, but only one-third are eligible. More high school graduates are going to college than in earlier decades, and about one-fourth are obese, making them medically ineligible. My Comment: Nothing can be achieved by force. Integral upbringing must come first and education only in parallel with it. Otherwise, students will not study. And with integral education, they want this education themselves; this is what we see in our system. Integral upbringing uses the natural inclination of children and adults, not pressure and coercion. “Austerity, he argues, has also been erroneously characterised as a European policy. My Comment: Not entering into a discussion with Barroso, we can say that there are objective laws of nature. To the extent of similarity with them, we win, and to the extent of our difference with them, we lose. And the more we develop, the more we feel either reward or punishment for the extent of our likeness to Nature. Excuses will not help us. It is possible to hide from criticism temporarily, but as Russia is paying for its “socialist” past, Europe will be paying for its incorrectly created unification for a long time. If I experience a real descent, within my bones, for more than one moment, then it is a sign that I didn’t make the correct effort! I must fall to the bottom for a moment, like Rabbi Shimon who changed from a great sage person to a simple market vendor. But this descent should not last more than a moment; this is enough. And then, I need to start using the connection with the environment, mutual guarantee, and all the means that I prepared in advance. At the time of descent, when I have fallen to the bottom of the sine wave, I cannot do anything, I become dead. From this hole, the stores I accumulated in the batteries of the group need to pull me out. But the moment that I exit a bit from the deepest descent, from the dead state, from the “ bottom,” I must ascend by myself, as much as I am able to participate on my own in this work. If I ascended by one or two millimeters from the lowest state, then to this extent I am able to scream. If I rise three millimeters, then I can already yell even louder, etc. I am not allowed to wait for time to pass by itself! I must try to rise, no matter how difficult and futile it may seem. It is specifically here at the bottom of the sine wave, at the exit of the descent, that I must invest the most efforts. It will show that I truly long for the goal. The main effort is in clarification, self-analysis: what for, why, what is the goal, who can help me, where is the Light that Reforms, how I can use that Light? I’m not going to pull myself out of the descent. I know that “a prisoner cannot liberate himself from prison”. Only the Light can help me, and I look for it. The problem is that we try to correct ourselves by ourselves. It should be clear that this is impossible. But if I know that the Light can do this and that It operates according to my efforts, according to my equivalence of form towards Him, then I begin to work with it mutually, like partners. I only need to prepare myself each time, so that the Light will operate on me, and it acts. And again I prepare myself, and again it acts. And in this way we alternately work together and I already have a common language with Him, understanding, and closeness even though we are opposite to each other. I do something and also He does something in response. In this way we begin to understand each other and connect. Question: If I am on a lower level, where will I find the deficiency to rise to the upper level? Answer: True, for the time being you are on a lower level and cannot desire the upper level, but you play as if you want to rise, and by that you summon the Reforming Light. There is a connection between the levels: If you want to be on a higher level than you are now, the Light comes to you from that upper level and it isn’t imaginary anymore but real, and it influences you from a distance by bringing you closer to it. Thus you advance. This is called your prayer, MAN. There is an upper Partzuf and a lower Partzuf. The lower cannot rise to the level of the upper, but it performs different actions as if showing that it wants to become like the upper. This desire is feigned, but it is called a prayer. It’s a lie and hypocrisy, but I want to rise! The upper Light, MAD, comes in response to my prayer. Although I am below, I am answered according to the gap between my hypocritical lie and some real desire for the upper; this is the gap between the desired and the actual. In fact, it isn’t real, but I still want some change. The actual comes from the heart and what we desire comes from the point in the heart. If the point in the heart has awoken in a person, then there is a dichotomy. The greater the gap (Delta – ∆) between the heart and the point in the heart, the stronger the MAN, and thus it summons a greater effect from Above, MAD. 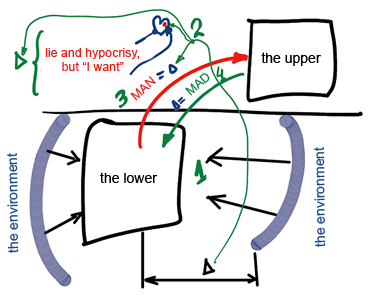 The lower has to attain such a false feeling, as if the connection with the upper is more important for him than the filling. In order to do that there is the environment around me that influences me from all sides. The more correctly I place myself in the environment, this Delta (∆), I basically define the Delta in my prayer between the heart and the point in the heart. The first impression is made by my action in the group (1) and this brings me to the second Delta (∆) between the desire of the heart and the point in the heart (2). This is what determines the intensity of my prayer, MAN (3), upon which comes a stronger Light from Above (4). A Lack of Imagination Or A Lack Of Unity?